Also known as our “Diamond in the Wilderness”, this grand Chateau sits on the shores of Lake Louise, overlooking the Victoria Glacier. One of Banff National Park’s first mountain resorts, the guest rooms are all furnished with an alpine charm. A variety of Lake Louise winter tours and activities await just outside the door including cross-country skiing, snowshoeing, ice-skating, dog-sledding, snowmobiling, ice-climbing and of course downhill skiing and snowboarding at the Lake Louise Ski Area. The Fairmont Chateau Lake Louise has one of the most frequent bus services to the Lake Louise Ski Area (every half hour). The Lake Louise Ski Area is about 15-20 minutes away on the complimentary Lake Louise ski bus service. 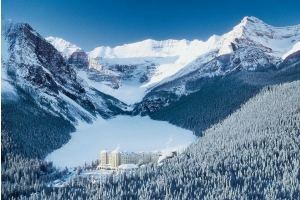 Contact us for more information or to book this luxurious Lake Louise hotel. Experience the ultimate in service! Available Gold Floor Rooms located on the 7th floor include the following room types: Fairmont Room, One-Bedroom Suite and Junior Suite. - Private Fairmont Gold check-in/out on the 7th floor. - Access to an exclusive concierge service, daily from 7 a.m. to 11 p.m.
- Fully stocked honor bar, daily from 11:30 a.m. to 11 p.m.